This sophisticated laser printer has an especially user-friendly touchscreen that’s a touch ahead of every other MFP and it offers more features than most too. Plucked from its WorkCentre range, the 6515 is a modest multifunction 4-in-1, by Xerox standards. It is aimed at the small to medium sized business and a small workgroup, and we think it is very generously specified for the task. It certainly includes all of the key features an SMB could need, from fast duplex printing to cloud services like iCloud available for scanning and printing. But there are more advanced tricks here too, such as emailing a scan to your phone, or photocopying both sides of a page without having to turn the paper over. Printing is fast, the resolution is high (1,200 x 2.400) and so is the paper capacity (300 sheets), but the thing that makes the Xerox WorkCentre 6515 stand out is its large colour touchscreen that looks and feels like a smartphone. It means all of those features are readily accessible at the printer, rather than persevering with fiddly hard buttons, or relying on a smartphone to access them. The price varies widely online for this model, but at £264 (around US$349, AU$472), it appears to be offering a lot of bang for your buck. The low cost is could be explained by the setup cartridges that come supplied, which contain only enough toner for 1,500 mono prints, and 1,000 colour, whereas a standard capacity black toner cartridge for this model has a 2,500 page yield. We can’t really call the Xerox WorkCentre 6515 compact, but the familiar form factor works well enough and it feels well made. Wherever you end up installing it, the tilting touchscreen can be tilted to face you and it is visible from several meters away. There’s an automatic document feeder (ADF) at the top, which can hold 50 sheets of paper. Below that is an A4-size scanner bed, which sits above an out-tray capable of holding 150 printed sheets. And below that is the body of the printer housing the drum and four toner cartridges and a pull-down flap door that reveals a multi-purpose paper tray. This is where you can put up to 50 sheets of headed letter paper or a stack of envelopes. Below this is a drawer that acts as the main paper tray and can hold 150 sheets of A4. If this isn’t enough for your needs, you can buy another drawer unit to stand this one on, which will expand the total capacity to 850 sheets of paper. Ethernet, power and USB connections are at the rear and because Wi-Fi is an optional extra on this model, you have to connect the wireless module yourself. It simply pushes into a corresponding socket. Wi-Fi comes as standard on the 6515-DNI and is optional on the 6515V-DN. The Xerox WorkCentre 6515 is a four-in-one that can do much more than print, scan copy and fax. With the optional Wi-Fi module included, this MPF can also print your emails, or email scans directly to you. It can also print from cloud services like iCloud from the Xerox Print Portal app. It can not only print both sides of page, but scan both sides of a document without having to turn it over. There’s a front USB port for printing from, or scanning to a flash drive and an ADF that can take up to 50 pages of A5, or A4, or anything in between. The print speed is around 28ppm in single mono pages and the resolution is nice and sharp at 1,200 x 2,400dpi. The scanner resolution is a little low at 600 x 600dpi, but that’s fine for capturing documents with reasonable clarity. One feature that you won’t find implemented so well on another printer is the tablet-style touchscreen interface. It’s not as sensitive as the one on your smartphone, but the familiar navigation system saves time spent standing next to the printer. Unlike the much more expensive Xerox VersaLink C7020, the WorkCentre 6515 does not support the company’s Extensible Interface Platform, which includes the more exotic features such as the document translation app. So while you can use the same Xerox Print Portal iOS/Android app for both, only the print functions will work here. The only tricky part of the installation process is lifting this 30kg printer out of its box. After that, you simply follow the printed step-by-step instruction in the user manual, which begins by removing all of the orange transport tape. Our model came with the optional W-Fi module which plugs into a port at the back. Previous tests of Xerox machines have involved long phone calls with tech support teams to get them up and running, but this one worked straight out of the box. The large touchscreen display, which has been designed to navigate like a smartphone, makes this model particularly user-friendly. The setup wizard allows you to configure both a wired and a Wi-Fi connection and lets you enter your own email and SMTP address, so you’re all set to print out emails or email scanned documents to yourself. The touchscreen does away with the need for any had buttons, other than the on/off switch and makes daily operation especially easy. The touchscreen is not as sensitive as the one on your smartphone, but it is better than that of the Canon Pixma TR8550. The Xerox WorkCentre 6515 is not quite as fast as the Brother MFC-L8690CDW, but it is very smooth and quiet in operation and more consistent in its output. Mono text documents are indistinguishable between the two machines, both being very accurately and lightly printed with no examples of smudged toner, or missing toner that we could see. The Xerox machine does a slightly better job with colour documents and photos. The filling is smooth and consistent where you have blocks of colour, rather than grainy, which give you a more appealing and professional finish. Each printer we source for testing is measured on our test bench and the results are critically compared with every other model we have reviewed. Rather than relying on the manufacturer’s quoted figures, we time the first page out and print speeds in single sheet and duplex mode using a standard ten-page document and a stopwatch app. To compare print quality, we print out the same set of test documents on every machine. These twelve test pages include text of varying font sizes and colours, mixed image and text pages, a set of photos and a series of test patterns designed to assess sharpness, colour fidelity, contrast and grey scale. We also calculate running costs, compare functionality and consider each product’s versatility, design and build quality. The overall score reflects all of these parameters and overall value for money. Photographs printed on plain laser paper suffer from banding and an unnatural sheen, as with most laser printers, but the colours are at least quite natural and reasonably well contained. It makes a slightly better fist of it than the Brother MFC-L8690CDW. Although it takes up a lot of space, the Xerox WorkCentre 6515 is a real pleasure to use thanks to the big touchscreen and quiet operation. The Xerox WorkCentre 6515 feels like a well-designed and sophisticated laser MPF that includes more features and better specifications than your average small office machine. Duplex printing is essential, but dual side scanning without having to flip the document yourself, is a feature that’s usually reserved for more expensive machines. Features like this and printing emailed documents, or scanning to the cloud are all made easy by the excellent touchscreen LCD. Its tablet-style layout will be familiar to all, so you should waste less time trying to figure it out. It’s print quality is above average too, with clean, crisp and evenly coloured documents emerging every time. This upright form factor demands a certain amount of space in your office and is too tall to sit on a desk. And given the size, it’s a pity it can’t handle A3 documents, or hold more than 250 sheets in its main paper tray. It is not compatible with any of the EIP apps that Xerox’s premium printers support, so you cannot add the document translation app for example. Photographs tend to appear banded where shading is blocked together. This is a sophisticated and very well featured MFP that will suit a small office that has the space to accommodate it. It is a pleasure to use, thanks to the tablet-style touchscreen, and has some neat tricks, like scanning both sides of a document, while keeping its print quality above average. 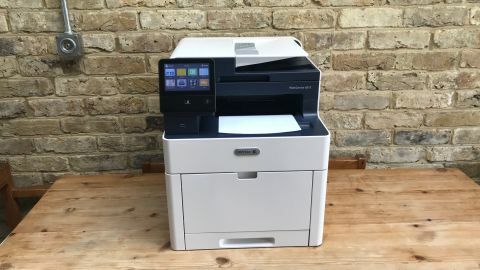 Photos don’t look great, as is often the case with laser printers, and the full retail price is rather high, but this premium machine will be a real asset in any busy medium-sized office.